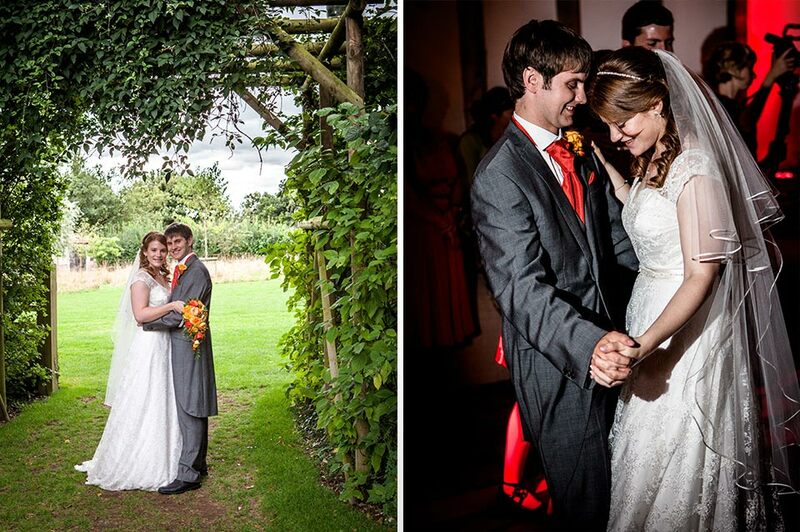 Rebecca and Andrew knew that they wanted their wedding day to be warm, relaxed and fun for all of their guests. 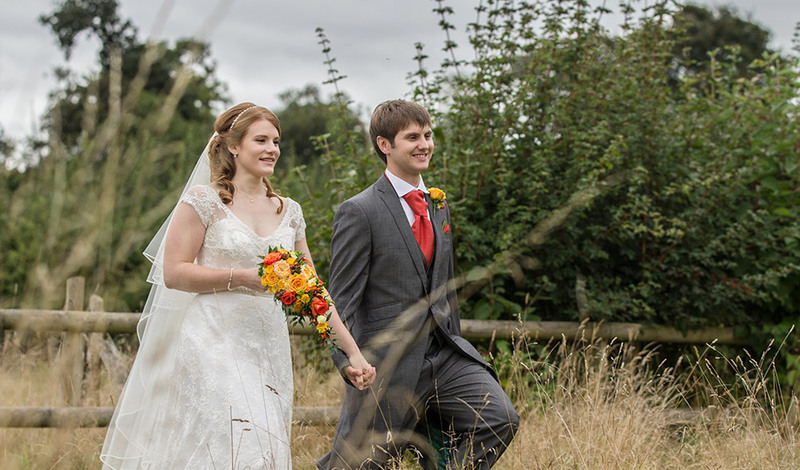 This wedding was a wonderful celebration and everyone definitely enjoyed this autumnal occasion. “We knew we wanted a barn venue, but most are just empty shells. Clock Barn is very different. Not only is it beautiful and the staff amazing, but also what we really loved were the individual rooms that are so versatile. We loved the idea of the cosy fireplace room that people could escape to if they wanted a drink away from the dancing. We could really see how each space would come alive.” – Rebecca. The couple decided against a strong theme and instead opted to have a ‘nod to autumn’ throughout. 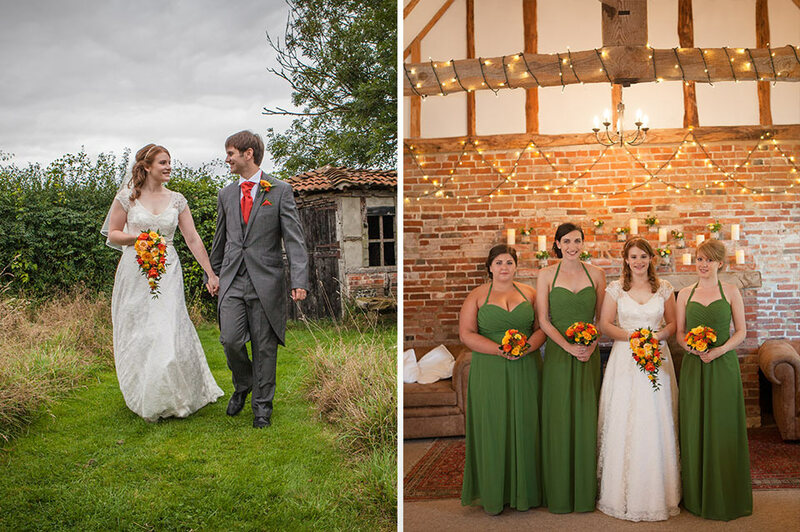 “We love autumn colours like oranges, yellows and reds, and felt this would work really well with the barn. 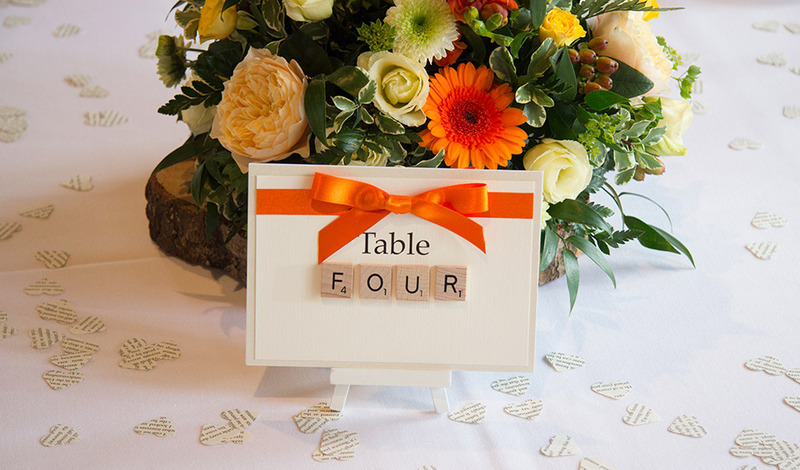 We thought this would fit well with a mid-September wedding, providing we didn’t go too overboard with the autumnal decorations in case we had nice summery weather!” – Rebecca. 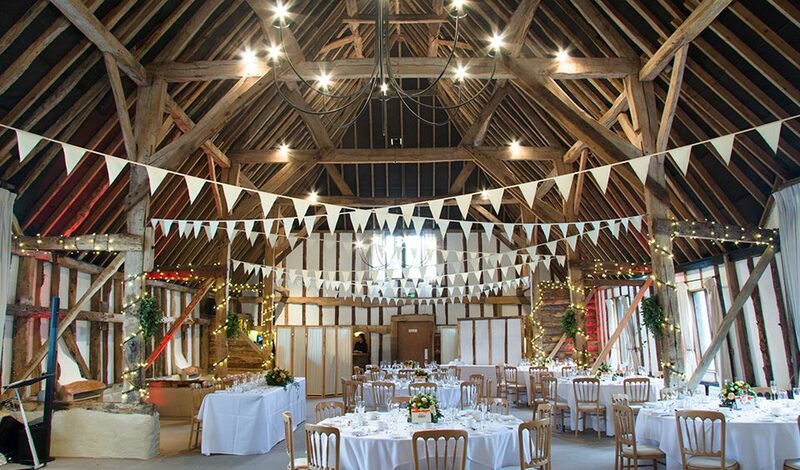 On the day, plenty of foliage was used throughout the venue along with the white bunting and fairy lights that are available to everyone at Clock Barn. 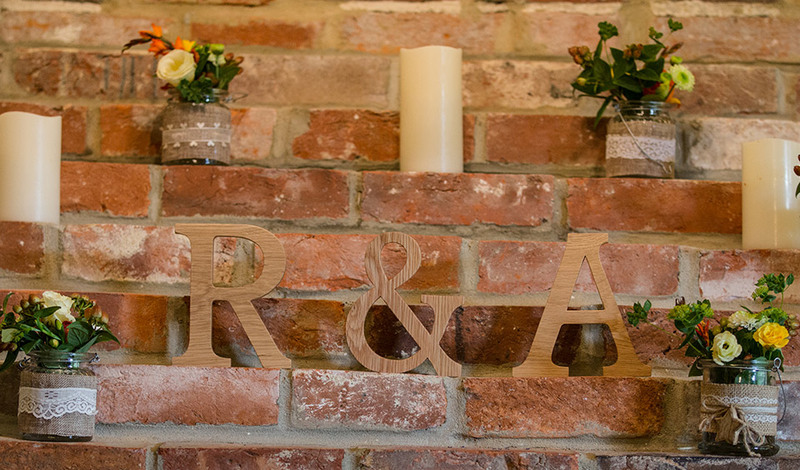 The couple added wooden letters spelling out ‘R & A’ on the fireplace and they also made their own confetti from old book pages. 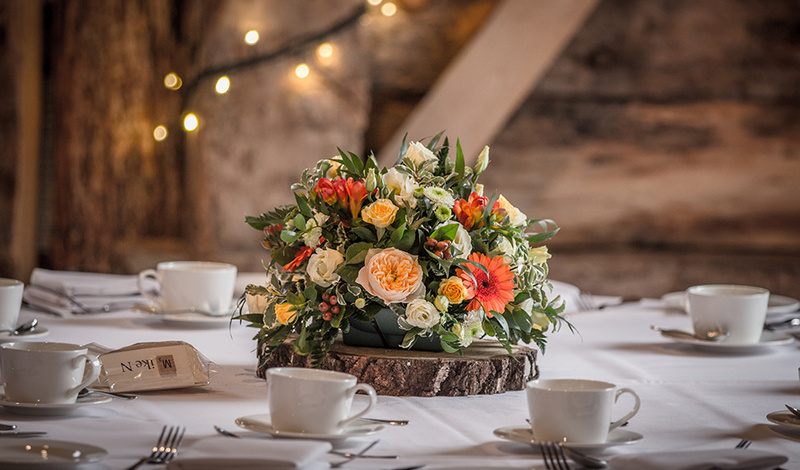 When it came to flowers, The Blooming Workshop provided gorgeous blooms that included mini gerberas, roses, lisianthus, gypsophila, hypericum berries and ivy. The groom, best man, usher and the bride’s father all had different buttonholes while Rebecca carried a small teardrop bouquet featuring flowers in autumn colours. “Tracey, the designer from Chanticleer created the design when she saw I was struggling to find my perfect dress. I was so nervous to see how the beautiful sketch had translated into fabric but I wasn’t disappointed. I felt like a bride the first time I put it on. 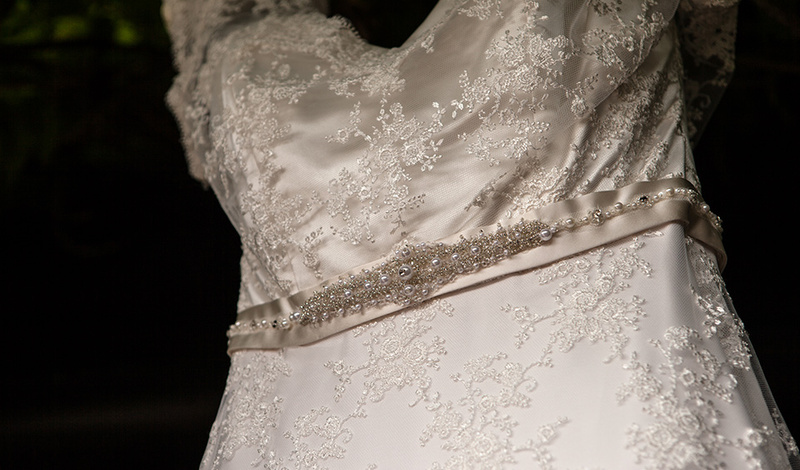 It had a V-neckline with a low back, cap sleeves and a half circle skirt made out of the most stunning, delicate lace. I love it because it is one of a kind and reflects my personality perfectly.” – Rebecca. 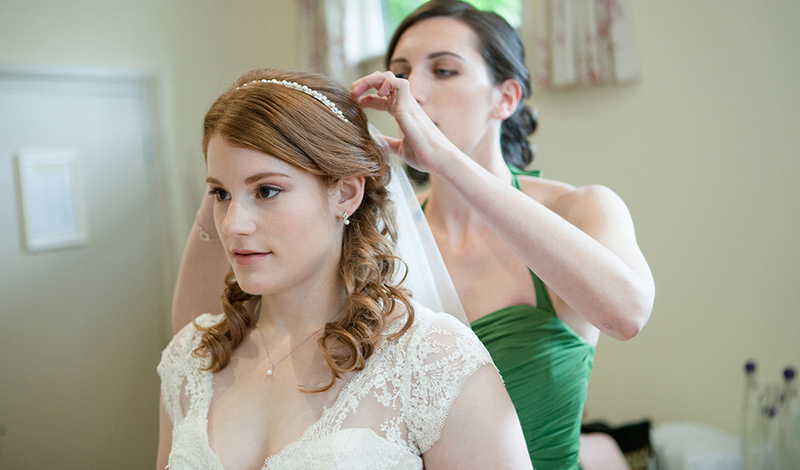 Rebecca also wore a long, tiered veil, white lace shoes, a custom pearl and crystal headband from Rosie Willett, a vintage pearl bracelet and a single pearl on a white gold chain and pearl droplet earrings from Goldsmiths. Andrew wore grey tails with a brilliant peacock print lining from Moss Bros while the bridesmaids wore long forest green chiffon dresses with silver heart shaped earrings and a silver heart shaped bracelet from Not On The High Street. 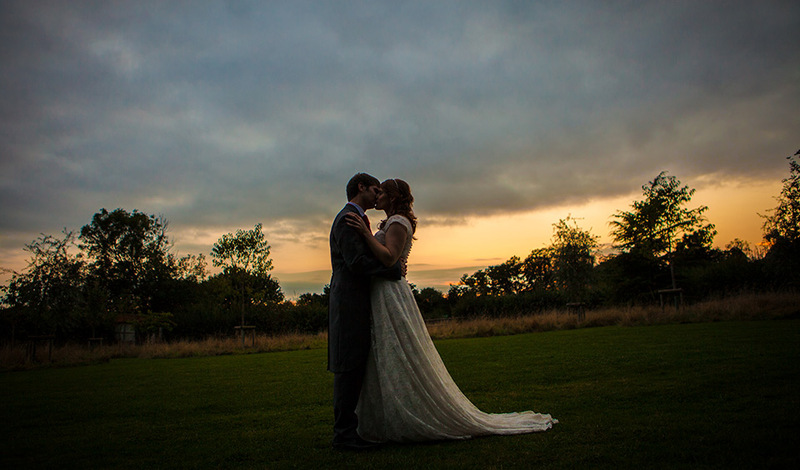 After a beautiful civil ceremony, accompanied by Apollo Strings, at Clock Barn, Rebecca and Andrew began their celebration with their family and friends. Berry Blush cocktails were served in the fireplace room along with a mouth-watering selection of canapés that included mini fish and chips and mini shepherd’s pie. 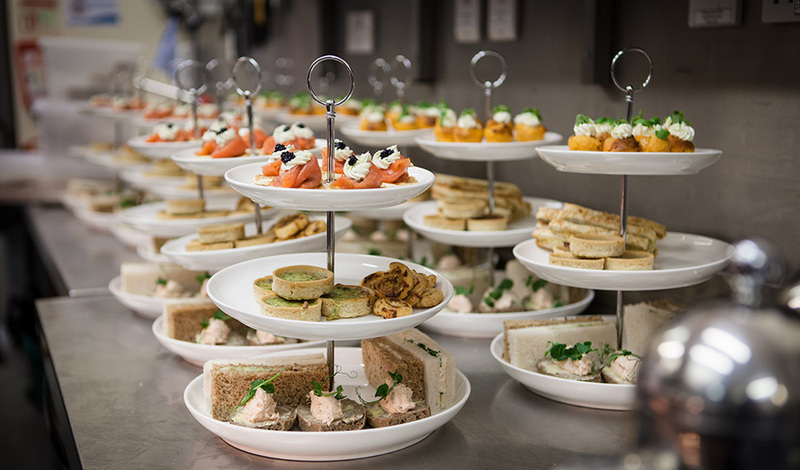 The couple also chose to serve afternoon tea for their wedding breakfast with bubbles in lieu of a formal meal because they felt this would create the relaxed, informal atmosphere that they wanted for their day and they were absolutely right. 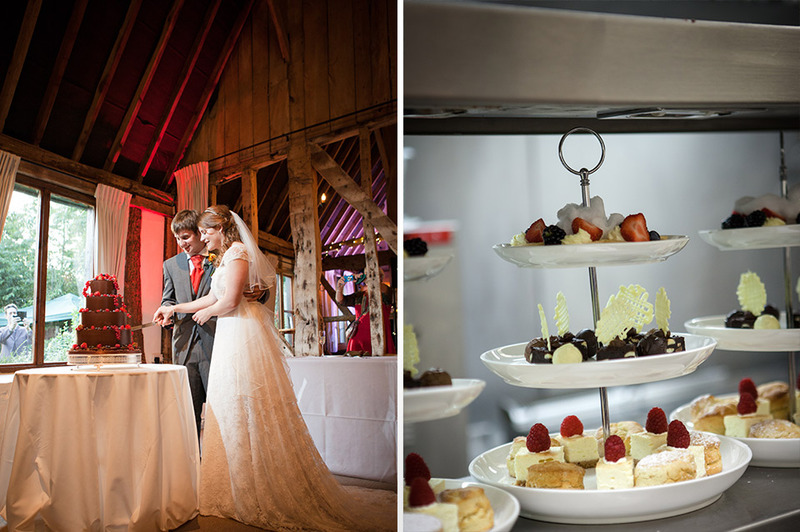 Rebecca and Andrew’s four-tiered cake wrapped in sheets of chocolate and decorated with berries was the perfect centrepiece. This delight form Le Papillon Patisserie included layers of pistachio, lemon drizzle, chocolate with salted caramel buttercream and vanilla with raspberry buttercream. It was definitely a hit with everyone! During the evening, everyone enjoyed delicious wood fired pizza with toppings that got everyone talking – spiced pepperoni and chorizo with mozzarella and roast garlic, and spinach, goats cheese with toasted pine nuts and basil pesto. Guests also enjoyed the sweet buffet that Rebecca and Andrew had created in the evening too. “My advice would be to plan your time and give yourself a realistic amount to do each month. When it comes to the day itself, forget about what should be happening and what might go wrong, and just go with the flow. If you can afford it, think about getting a short highlight wedding video. We are absolutely over the moon with ours as it shows all the wonderful moments we didn’t get to see, and captures the fun atmosphere of the day. We will treasure it.” – Rebecca. Ever wondered what Clock Barn would look like in the winter? Well then check out Stef and Nicky’s beautiful winter wedding and take a look at what’s possible!